Whoever has seen how cases are handled when they are being loaded and unloaded onto aircraft knows the treatment to which they are exposed. 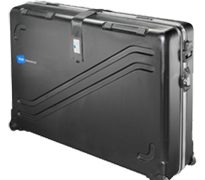 Our cases are built with reinforced corners, robust smooth-running wheels with reinforced axles plus integrated tension belts. Advice on taking a bicycle on an aeroplane. Reasons for taking your own bicycle with you: Every cycling fan knows from experience that it is much better to ride one’s own bike. It is safer, you know your own bicycle inside out, the saddle is in the correct position and you are familiar with the brakes and gears and you know what condition they are in. Before the trip • After booking a trip inform the travel agency that you wish to take your bicycle with you. • This request will then be passed on to the airline company and they will let you know their decision separately. A charge will be levied for this service. The departure flight • We recommend checking in on the previous evening if you are taking an early-morning flight. This will save you time on the day of departure. • Upon receipt of your boarding card the bike box is handed in at the bulky luggage desk package. At the destination airport • Booking a trip with a package holiday: a charge may be levied for transporting your bicycle from the airport to the booked hotel and back even when book the holiday to cover any extra costs which may be incurred! • Booking a trip with a cycling holiday tour operator: The transport of a bike case is often included in the price. If the case is damaged • Damage to the case must be notified to the airline company straight away, at Lost & Found.